Pakistan 250 (Nasir Jamshed 106, Mohammad Hafeez 76, Ishant Sharma 3-33, Ravindra Jadeja 3-41) beat India 165 (MS Dhoni 54*, Virender Sehwag 31, Saeed Ajmal 3-20, Junaid Khan 3-39) by 85 runs. Pakistan hammered 250 runs after a solid opening stand of 141 runs between Nasir Jamshed and Mohammad Hafeez. The Indian batsmen had no answer to the lethal bowling attack of the visitors and managed 165 runs with 12 balls remaining. Nasir Jamshed (Pakistan) was declared ‘Player of the match’ for his majestic knock of 106 runs. 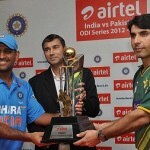 The second One Day International of the three match series was played on Thursday, January 3, 2013, at Eden Gardens, Kolkata. Earlier, MS Dhoni, the skipper of India, won the toss and offered the batting to Pakistan under the overcast conditions. Nasir Jamshed and Mohammad Hafeez got off to a good start by scoring 29 runs in the first five overs. The first hit 2 consecutive fours in the seventh over and the latter got 10 runs in the 9th over with 2 fours. Mohammad Hafeez was the most aggressive of the two, reached his 9th ODI fifty in the 14th over with another 2 fours and the first hundred of the innings was displayed on screen in the 17th over. Nasir Jamshed got his seventh ODI half century in the 19th over with a four as Mohammad Hafeez kept on gathering runs from the other end. The duo added 12 runs in the 23rd over with 2 fours as Mohammad Hafeez lost his wicket in the next over after playing a fine innings of 76 comprising 10 fours. The first wicket fell at 141 and four runs later Azhar Ali ran himself out for just two runs as Younis Khan walked in the centre. Nasir Jamshed hit the first six of his innings in the 27th over and the score was enhanced to 177 when Younis Khan was declared leg before wicket off Suresh Raina for 10 runs. The poor form of the Green Shirts captain, Misbah-Ul-Haq continued when he became the next victim for two runs after the addition of five runs to the total. Shoaib Malik joined in next with Nasir Jamshed who smashed his third consecutive ODI century against India on the third ball of the 40th over with a four. Ravindra Jadeja struck in the 42nd over when he removed the centurion Nasir Jamshed and Kamran Akmal. Nasir Jamshed plundered 106 runs off 124 balls with 2 big sixes and 12 fours whereas Kamran Akmal was unable to score any run. Shoaib Malik and Umar Gul were the only two batsmen who achieved the double figures by scoring 24 and 17 runs as the Men in Blue took charge of the game. Six batsmen surrendered their wickets in single figures as the visitors were bowled out for 250 runs with 10 balls to spare. Ishant Sharma and Ravindra Jadeja were the main wicket takers with three wickets each whereas Bhuvneshwar Kumar, Ravichandran Ashwin and Suresh Raina shared one wicket each. The Indian innings was opened by their experienced pair of Gautam Gambhir and Virender Sehwag. They started off nicely by reaching 31 runs in the first six overs as Mohammad Irfan and Junaid Khan were bowling at their best. The score was accumulated to 42 when Gautam Gambhir played the fifth ball of 10th over on to his stumps off Junaid Khan. Virat Kohli took guards at the wicket next and got six runs in the next over with one four but was caught behind smartly by the wicket keeper Kamran Akmal off Junaid Khan for 6 runs. Mohammad Irfan was replaced by Umar Gul in the 13th over and the latter maintained the pressure on the batsmen with his accurate bowling. Umar Gul made another dent in the batting of the Blue Shirts by removing Virender Sehwag in his next over for 31 off 43 with 3 fours. Yuvraj Singh and Suresh Raina got together in the centre but they found it hard to score the runs freely. Yuvraj Singh was the next batsman who was caught behind by Kamran Akmal off Umar Gul for 9 runs and the hosts were struggling at 4-70 in 18.5 overs. MS Dhoni entered the park under huge pressure once again and tried to stabilise the innings with Raina. The boundaries were dried up and the run rate kept creeping up as the master off spinner, Saeed Ajmal, was surprisingly introduced in the attack after the 24th over. The Blue Shirts faced another blow when Suresh Raina was stumped excellently by Kamran Akmal off Mohammad Hafeez for 18 on the last ball of the 26th over at 95 runs. Ravichandran Ashwin associated with Dhoni as the Pakistani bowlers continued with their tight line and length. The next five overs produced just eight runs without any boundary and the required run rate went up to 7.77. Misbah-Ul-Haq handed over the ball to Shoaib Malik in the 32nd over and he got rid of Ravichandran Ashwin when the batsman was stumped by Kamran Akmal on the third ball for just three runs off 22 balls. Ravindra Jadeja appeared in the centre and much was expected from Dhoni at that stage of the game but the batsmen were unable to score briskly. They took the score to 131 after 38 overs when Saeed Ajmal crippled their hopes by grasping the wickets of Ravindra Jadeja, Bhuvneshwar Kumar and Ashok Dinda in the next over. India was reeling at 9-132 as Ishant Sharma got together with Dhoni who compiled his 47th ODI fifty with 3 fours in the 48th over. MS Dhoni remained unbeaten for 54 off 89 with 1 six and 4 fours as their innings was folded back at 165 runs in 48 overs. Saeed Ajmal and Junaid Khan were the chief wicket takers with three each, Umar Gul took two whereas Mohammad Hafeez and Shoaib Malik claimed one wicket each. Pakistan won the second ODI with a big margin of 85 runs, clinched the series and is currently leading the three games at 2-0.